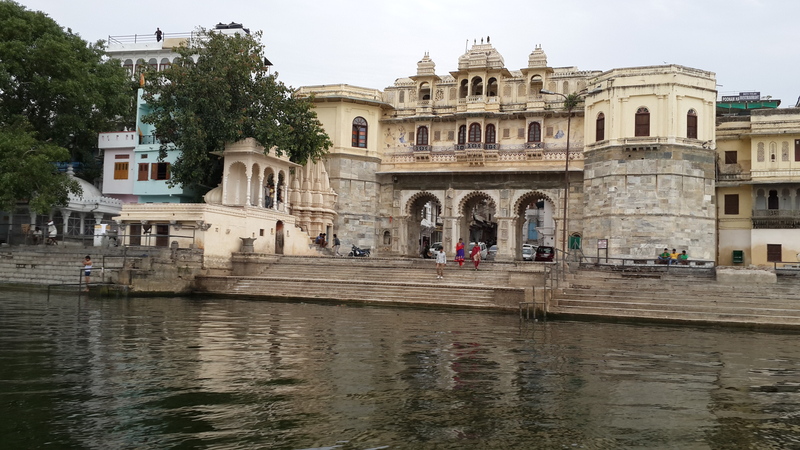 More on Rajasthan. 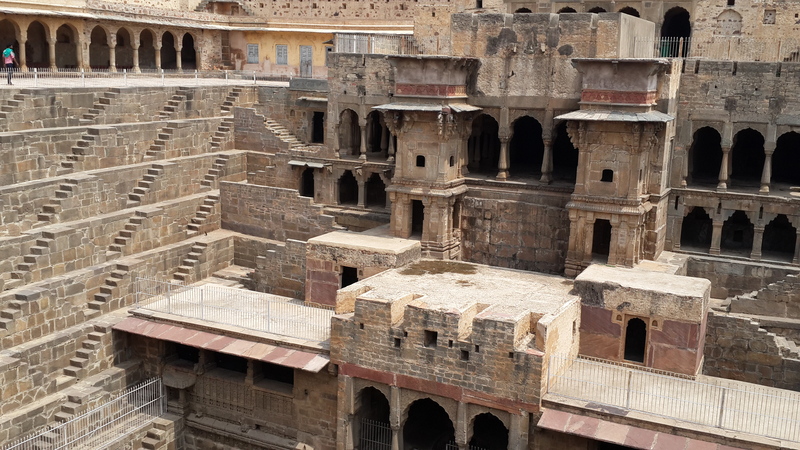 One of the places on this summer’s itinerary was a village called Chand Baori. “Do we really want to go there?” I asked the driver and tour guide. “I’ve never heard of it.” “Very old well, from the 8th century,” he assured me. “If you like we can go.” Which was a roundabout way of saying yes, so we went. 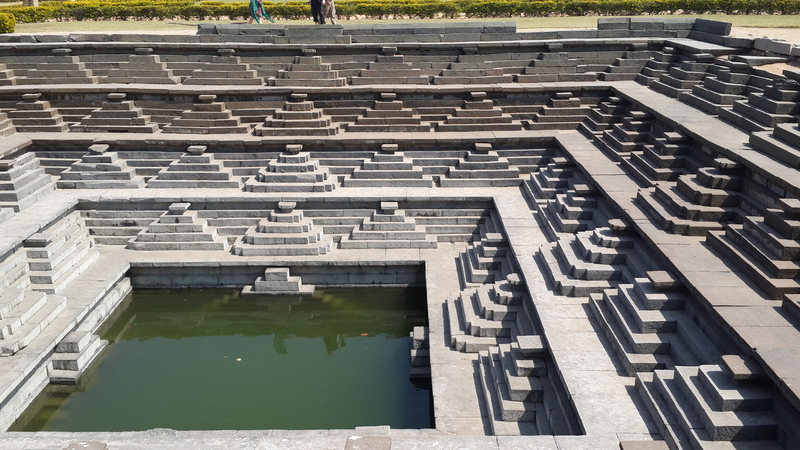 On a trip to the ruins of Hampi (1343 to 1565, capital of the Vijayanagar empire) a year ago, we had seen a 500 year-old stepwell that was a work of art. It had not run dry in living memory and had presumably been in active use by the local populace for more than 5 centuries. Hampi lies in a zone that tends to the semi-arid and receives around 400 mm of rain a year compared to ca. 900 mm for a typical Mediterranean city (in this example Ostia Antica, the harbour city of ancient Rome). However, Hampi’s modest rainfall is a veritable flood compared to the sparse annual haul (ca. 200 mm) of the desert area around the flourishing city of Jaisalmer in Rajasthan. 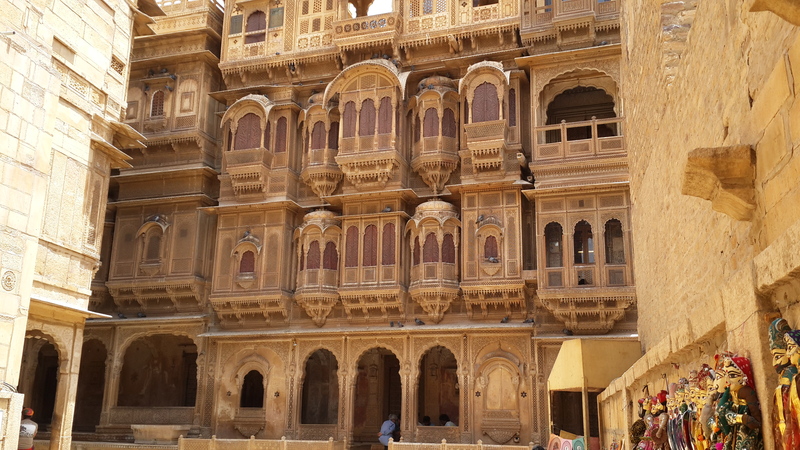 Founded in the 12th century, Jaisalmer was an important node in the overland silk route and well connected with Europe. A great deal of knowledge and deep understanding of sustainable living in harsh climates accumulated in this part of the world long before scientific knowledge became codified and PhD’s in hydrology were awarded by the world’s universities. 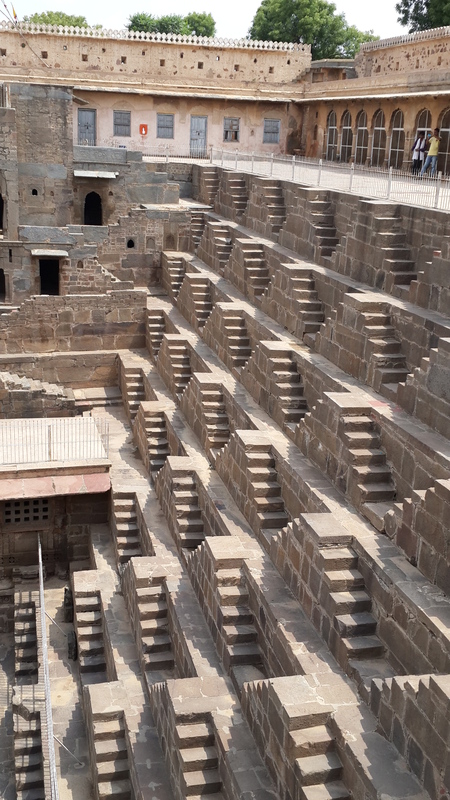 Despite the fierce July heat, our detour to Chand Baori was well worth the effort. The stepwell in the village was more ornate than anything we had seen so far. Much more than being a mere source of water, it was obviously designed as a public meeting place and center for social interaction where one could find cool relief by the water’s edge, two or three stories underground. With no money and only hand tools at his disposal, he began with a few friends to dig out an abandoned “johad,” a traditional water catchment reservoir. The rains came. The johad retained a little water. This was the beginning of a virtuous cycle that was copied by neighbouring villages. In the course of a few years, over 5000 earthen check dams or johads have been built in Rajasthan and neighbouring states of Gujarat, Madhya Pradesh and Andhra with rising water tables as a result everywhere. It is time for the world to grasp them. Click the Follow button below for alerts to forthcoming postings on this blog and find out how people around the world are grasping these opportunities. For some people the best journeys are those that take place in the mind. If you have good company and travel in the right frame of mind, an inward transformation occurs with each step and each changing view of the landscape. This was a summer of encounters in Rajasthan that changed the inner landscape of my mind but words are a poor way to show the changes, so I will post a few pictures here instead. This is offered by way of apology that this blog has been inactive for the past six weeks. Rajasthan is India’s largest state. At 340,000 sq. km, around the size of Germany, it comprises 10% of India’s territory. The name, literally “the land of kings.” is very apt. There are ruins aplenty and reminders of past glory at every turn. 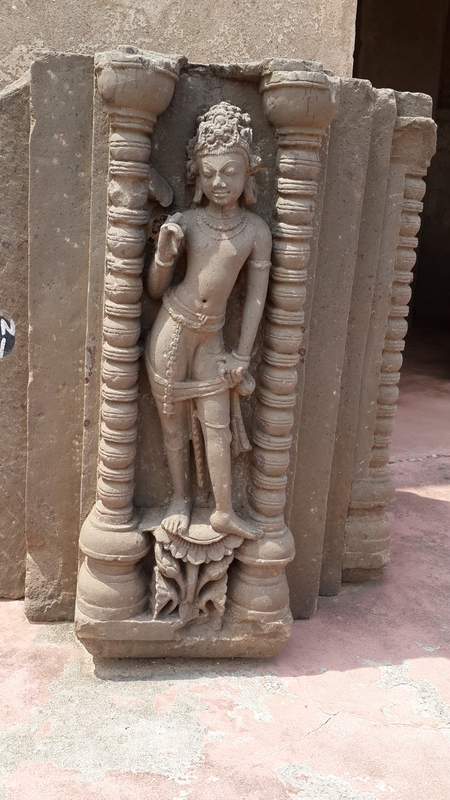 But take a moment to look behind the ruins and there are stories behind every crenellated wall and jharoka. This is also a land of stories, a place where myths are born. The stories are a glorious mix of fact and fantasy, like the great Indian epics themselves, the Ramayana and the Mahabharata. More about this land and the stories in the blogs to follow.